I was exploring creating ASP.NET Razor Web pages using Visual Studio. A problem for me was that using the built-in VS ASP.NET Razor template generated an enormous amount of files. The template created a site with an About page, a Login page, and all kinds of other things. I wasn’t sure what was required and what was optional. So I set out to create the simplest possible minimal Razor page. First I launched VS in administrator mode (see note at end of this post). Annoyingly, VS has two different ways to create Web sites: File | New | Project | C# | Web, and also File | New | Web Site | C#. The two approaches are very different, but to cut to the chase, I prefer File | New | Web Site | C# | Empty Web Site (basically working with raw files rather than creating a binary Assembly that must be deployed). In the “New Web Site” dialog I specified HTTP as the Web location because I had Internet Information Services set up on my machine, and hxxp://localhost/TestWebSiteProject as the name — even though I started with File | New | Project, the New Web Site approach does not generate a .csproj file. After clicking OK, I got an almost empty Web site — only files Web.config and Web.Debug.config were created. In the Solution Explorer window, I right-clicked on the bolded project name and selected Add | Add New Item from the context menu. I looked for an ASP.NET Razor page or anything with a .cshtml file extension but there wasn’t any such item. So, instead, I added an empty text File and accepted the default TextFile.txt name, then right-clicked on the file name and changed it to Hello.cshtml. Note: I replaced less-than and greater-than in the XML above with parentheses so my blog post software stays happy. I saved all my files (CTRL-SHIFT-S) and hit F5 and the page loaded and displayed in Internet Explorer. Finally I added some C# Razor markup, saved, and the simplest possible ASP.NET Razor Web page worked. 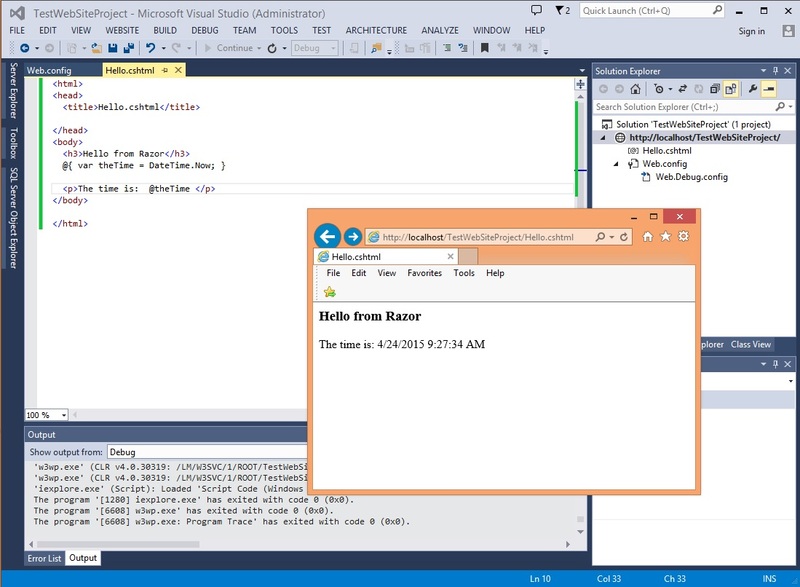 Note: I like to launch Visual Studio from the Run command box. When doing any Web work, VS must run in administrator mode. To do that, I went to devenv.exe (at C:, Program Files(x86), Microsoft Visual Studio 12.0, Common7, IDE and then right-clicked and selected “Troubleshoot compatibility”. Next I clicked on “Troubleshoot program”, and checked the “The program requires additional permissions” and then clicked through the screens, being sure to save the changes.